Let me begin by saying that I’m not angry. I’m just a little ticked and mostly curious. On Wednesday, the 2006 recipiant of the Cecil B. DeMille Award was announced as Sir Anthony Hopkins. 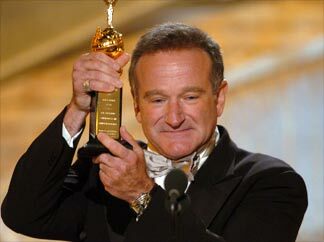 (Better than 2005 winner Robin Williams, I think.) Sir Anthony Hopkins is one of the greatest living actors. In The Silence of the Lambs, Amistad, A Bridge Too Far, The Lion in Winter etc., he delivers excellent performances and he rightfully deserves the Cecil B. DeMille Award. The Cecil B DeMille Award is the lifetime achievement award given annually by the Hollywood Foreign Press Association (aka the Golden Globes). Past winners include Walt Disney, Bette Davis, Jimmy Stewart, Alfred Hitchcock, Jack Lemmon, Sophia Loren, Al Pacino, and Audrey Hepburn. The only requirement to receive this honor is “outstanding contributions to the world of entertainment” to an internationally recognized and respected name. I have nothing against most of the past winners (except Barbara Streisand, who I absolutely abhor). To me it just seems as though certain actors were snubbed and other actors have received the award too early. My question is simple. Why didn’t Katharine Hepburn or Cary Grant ever receive this award? (I know the reason, if you’re curious. I’m afraid that if I go into it, I’ll never stop complaining.) Barbara Streisand (again YUCK!) has. Meryl Streep has yet to be awarded. Joan Crawford, Charlton Heston, Robert Redford, all have received it. Neither Warren Beatty nor Spencer Tracy nor Grace Kelly nor Gary Cooper nor Clark Gable nor Marlon Brando. Where’s Vivien Leigh, Claudette Colbert, or one of the Barrymores? In 1976, the award wasn’t presented at all. I realize that my bitterness is kind of pointless. Not everyone who deserves something gets it. I just keep< reminding myself that it is only the Golden Globes and that it’s the Academy Awards that matter. But if Meryl Streep doesn’t receive the Cecil B. DeMille Award soon and Tom Cruise does then I will be so angry that I won’t know what to do with myself. What is your take on this? Who do you want to see receive the Cecil B. DeMille award? Am I overreacting? Sound off below. I guess I pay more attention to the movie stuff that I think, because i know what you mean about these awards. I don’t know about Jodie Foster that much but, I can not for the life of me figure out what people find so attractive about Tom Cruise. He has a tiny little head & when he turns it just so…ugh! He is a horrible actor. I especially hate his performance in Rain Man because it is such a terrible match-up with Dustin Hoffman, who is a great actor. He especially pisses off my mom because he says that psychology is a pseudo-science, and being a psychologist, my mom doesn’t take kindly to that remark. Tom Cruise deserves to be beaten up by an angry mob of feminists. His laugh, his attitude, everything about him right now makes me want to kick him in the balls. Well he got that young girlfriend. But if Tom Cruise keeps going at the rate he’s going, he’s not getting anything ever. If Tom Cruise had balls, he could find a woman who was actually his age. Don’t know how you can have a lifetime achievement award and ignore Merle Streep or Hepburn (Kate, not Audrey). Sounds like a popularity contest. I agree Sable. Now Tom Cruise jokes aside. Here’s the reason why some actors didn’t receive lifetime achievement awards. Yes, it is a popularity contest, that is why Streisand has received one. She, for some people, is way more likable than Kate Hepburn ever was. Kate Hepburn (as most of you know is my IDOL) was a very dominating woman. She was forceful and superb at her craft. She was labeled box office poison at one point in her career. Therefore, some people did not like her AT ALL. Cary Grant never received a lifetime achievement award because he wasn’t a member of SAG. The only reason he received the Academy Award’s Lifetime Acheivement Award was because at the time Gregory Peck (Grant’s good friend) was president of the Academy and Peck pressured the other head honchos to give Cary Grant the award. Some actors like Spencer Tracy and Clark Gable, well they died in the 60’s (1967 and 1962 respectively) At the time, the Cecil B. DeMille award was mostly being given to movie heads and true reolutionaries (ie Walt Disney, Jack Warner, Jean Hersholt, Mayer). I believe Bing Crosby in 1960 was the first actor to receive the Cecil B. DeMille Award. And unlike the Academy Awards honorary oscar (the real lifetime achievement award if you ask me), is is NOT given posthumously. That’s enough random movie facts for now.